Installation View Athena Papadopoulos, The Smurfette. Courtesy of the artist and Emalin Gallery. Hull’s contemporary art gallery, Humber Street Gallery, which is managed and run by Absolutely Cultured, has today announced its next programme of exhibitions for spring 2019. The programme includes Athena Papadopoulos who will bring her first major UK gallery exhibition to Humber Street in April; Graham Jones and Richard Houguez’s Cut and local artist Ella Dorton’s exhibition Journey To The Centre of The Couch (Couches & Other Good Ideas). Over the coming months, the artists will exhibit their new ambitious work, commissioned by Absolutely Cultured, in the popular Fruit Market gallery. On Friday 12 April, Humber Street Gallery is delighted to present A Tittle-Tattle Tell-A-Tale Heart, Athena Papadopoulos’ (b.1988) first major institutional presentation in the UK. 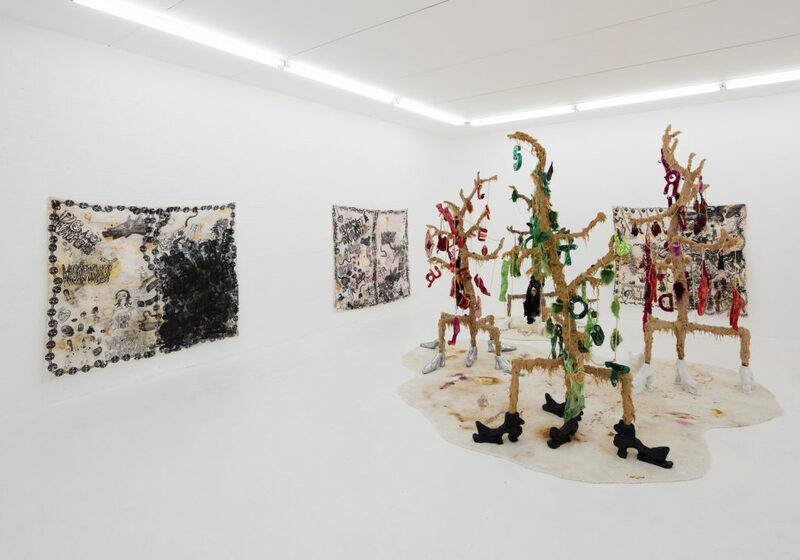 Based in London, the internationally acclaimed Canadian artist has exhibited widely and was recently shortlisted for the prestigious Max Mara Art Prize for Women, in collaboration with London’s Whitechapel Gallery. For Papadopoulos’ presentation in Hull, the artist reinterprets a selection of chapters from her eponymously titled novel, A Tittle-Tattle Tell-A-Tale Heart, to construct a narrative incorporating sculptures, sound installation, costume design and performance. Published in 2018, A Tittle-Tattle Tell-A-Tale Heart moves through different registers of textual experimentation, mimicking the detective story to uncover the tragic downfall and hopeful rebirth of the protagonist, Bunny. The exhibition will be divided into two distinct parts across both floors of the gallery, connected by a stairwell of light and sound. The first floor introduces the scene of a diseased and hallucinatory film set, where a quarantined zone encloses the hysterical experiences brought forth by haunted houses, theatre sets and the backyard of a childhood home. Upstairs, Papadopoulos takes as a point of departure the final chapter of her novel to explore notions of exhibitionism as enacted through fashion, music and childhood theatre. A host of performances curated by the artist will take place throughout the installation, embroiling the viewer in its midst. The artist’s distinct repertoire of edible, cosmetic and medicinal materials continues to be employed in this new body of work, pointing towards Papadopoulos’ ongoing interest in dismantling that which underpins cultural constructions of femininity, social experience and exteriority through complex materiality. The exhibition at Humber Street Gallery represents an evolution of Papadopoulos’ practice towards a mode of production that is fully immersive, expansive and transcendent, enabling her unfettered movement between performative roles and guises. Papadopoulos will collaborate with London-based artist HP Parmley (b.1988) to create a score featuring recordings of the artist reading characters from her novel. Senior Curator at Humber Street Gallery, John Heffernan, explained: “We’re really excited about this next stage in the gallery’s journey and are thrilled to be exhibiting Athena Papadopoulos’ inspiring work. Over the coming year there will be four core exhibitions in Galleries 1 and 2 and seven projects in our renamed Project Space, delivered by early career artists. “Presenting work that will inspire and engage audiences our newly revised programme format brings together a broad range of exhibitions, projects and events, encompassing internationally acclaimed artists, local practitioners and ambitious exhibitions that offer a deeply exiting contemporary art experience. From 6 April 2019, in the gallery’s newly renamed Project Space, artists Graham Jones and Richard Houguez will present Cut, a residency project exploring themes of social expression and the acts of self-care centred around their practice of hairdressing. Taking the form of a sculptural installation and events programme, haircuts and client interviews will be gathered to create sound and sculptural artworks. Their salon will be central to the installation as the barber’s chair becomes an axis for discussion and art making. Visitors will be offered free haircuts in exchange for stories and cuts of hair, which will be transformed into both sound and sculptural installation throughout the duration of the residency. John continued: “This project focuses on hair as social expression and an act of self-care while using this to open discussions of wider systems, such as the reproduction of art, communities and cities. Following on from Cut, on 24 May Hull-based artist Ella Dorton will present her first major project at Humber Street Gallery. Working with found fabrics and paint, the artist composes portraits that reflect the people of Hull. This work will see Ella develop a series of large-scale fabric collages depicting individuals and groups of people from her local neighbourhood. Creative Director and Chief Executive of Absolutely Cultured, Katy Fuller, said: “It’s a really exciting time for Humber Street Gallery. It has an important role in Hull to help bring world-class contemporary art to the city and ensure we continue to build on the incredible artistic and cultural foundations we have nurtured over recent years. The gallery’s programme will also include a number of new events for younger visitors, such as Early Bods. Be the first to comment on "Humber Street Gallery announces its upcoming spring 2019 programme"